From East and West, Midwest and South, credit union people in the news. From left, Ann Dubie, president/CEO of the $185 million NuMark Credit Union in Joliet, Ill., and the latest inductee into the 24,300-member credit union’s President’s Club, Tinley Park office member service representative Penny Kapanowski. 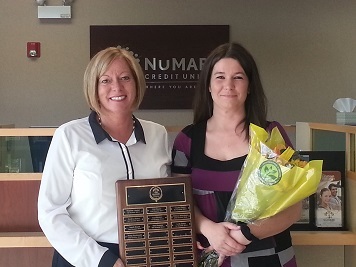 President’s Club members are chosen for their hard work, dedication and outstanding service to the members of NuMark Credit Union.